Why fly a drone when you can fly inside one? This post is part of the “Newswire” of this site. None of this content is my own, but just a full repost of an article that I found interesting and worth archiving on my own site. For more info check this blog post or if you would like to have it removed please contact me via this from. If you got here please go to the original source! 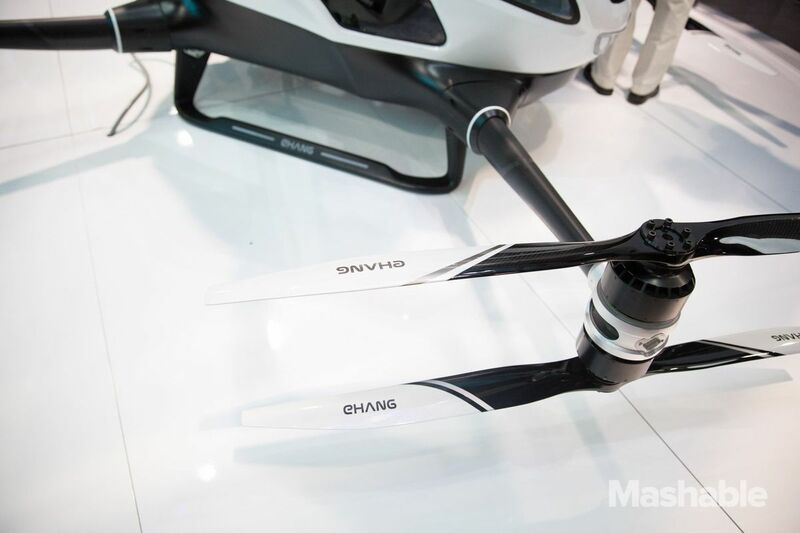 LAS VEGAS — Ehang has a crazy, and maybe brilliant, idea. We just have one question first: Are you ready to fly inside a drone? The Chinese drone maker unveiled a high-flying 500 lb. drone, which in theory would also be able to serve as an autonomous transportation vehicle for real humans — at CES on Wednesday. The Ehang 184 is a giant but elegantly designed drone; according to the company, it can transport one person at approximately 100 kilometers (62 miles) per hour on a roughly 23-minute trip. It can hold about 100 kg (220 lbs). An app plans your trip; simply select your destination and get in, and the drone takes off. A fail safe system will protect the consumer, and if any of the systems fail, the drone will either go into hover mode or find a safe landing spot. The all-electric drone has four arms, eight propellors, eight motors and two sets of sensors — as well as a redundancy to ensure safety in bad weather (or perhaps in case one set of sensors fails). Its website says that although the device is thunderstorm-proof, the command center will prohibit the vehicle from takeoff during extreme weather conditions. The Ehang 184 is not legal the U.S. yet. Ehang cofounder and CFO Shang Wen Hsiao told Mashable that they’re in contact with the FAA, which requires 28 hours of flight time to check air worthiness. The vehicle would take off and land vertically at pre-set targets. In the meantime, the company has met with government officials in New Zealand, in Los Angeles, California and China. New Zealand is interested in experimental tests, Hsiao said, and the Chinese government supports it but needs to undergo the application process. So far, the company has successfully completed more than 100 flights with an actual live person on board. Sadly, there will be no test flights at CES here since Las Vegas as a “big no-fly zone,” according to company executives. You can expect the Ehang 184 autonomous vehicle to cost between $200,000 and $300,000. For the past three years our favorite drone has consistently been produced by one company, DJI. There have been lots of interesting challenges from other startups in the US and China, but so far no one has produced a unit that delivers the same quality, consistency, and ease of use. In our most recent round of tests, however, we praised the basic capabilities of the Typhoon 500 drone from Yuneec. And today at CES Yuneec unveiled a new unit, the Typhoon H, the promises to deliver a high-end, Hollywood-caliber drone, but at just two-thirds of the price of DJI’s Inspire 1. The Typhoon H, like the Inspire 1, has retractable landing gear and a camera which can pan a full 360 degrees. Unlike the Inspire and the previous version of the Typhoon, the new unit has six rotors instead of four. Yuneec says this will allow the craft to remain stable and land in the event it loses one or two motors. DJI also has a six-rotor craft aimed at Hollywood professionals, the S900, which sells for $3,400 when fully equipped with a HD camera. 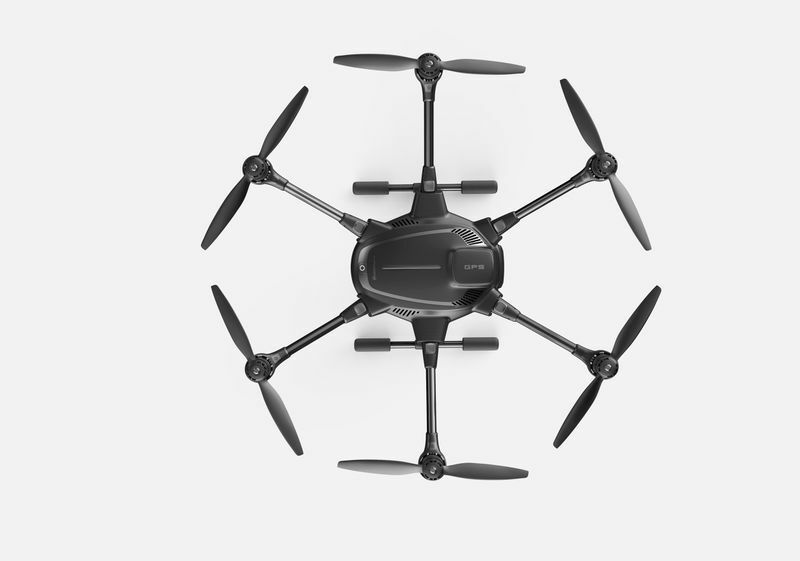 The Typhoon H is expected to retail for $1,799, while the Inspire 1 goes for $2,600. The new Typhoon H is also promising the full suite of autonomous features, something which has become table stakes for drones these days. It has Orbit, Point of Interest, Curved Cable, and something called Journey. It has basic sense and avoid technology on board, using “ultrasonic proximity detection” to automatically dodge large obstacles. In theory it should also give the aircraft more lift, allowing for heavier and more sophisticated camera equipment to be attached, as you can with the S900. All of this is a very attractive offering against the initial value proposition of the Inspire 1, but DJI has evolved that unit, along with accessories and autonomous software, in the year since it was released. The Typhoon H shoots 4K video and 12 megapixel stills, just like the original camera on the Inspire. But DJI now sells the Zenmuse, which can be attached to the Inspire, shoots micro 4/3 and RAW footage, and allows for more fine-grained tuning of color and focus while in the air. Pretty soon you’ll even be able to do thermal imaging. In terms of autonomous flight, the Inspire launched with very little. But DJI pushed a firmware update in the summer of 2015 that added point of interest, orbit cam, and Follow Me mode. In our testing we found DJI’s autonomous features were not quite as refined as what Yuneec and 3D Robotics are currently offering, but it also seems clear they will improve with time and can be updated over the air. The second half of this value proposition, the ability to see obstacles and prevent crashes, is something we’re looking forward to testing once we get our hands on a review unit. In addition to its ultrasonic proximity sensor, Yuneec said the Typhoon H was built to allow for additional components, such as Intel’s RealSense camera, to expand its capabilities in the future. If this tech works well, that would be a very compelling reason for any pilot, beginner or professional, to pick this drone over the current competition, none of which offer anything like robust sense and avoid. Today at TechCrunch Disrupt London 2015, the CEOs of Sky Futures, Verifly and Airware took the stage with TechCrunch writer Frederic Lardinois in an attempt to explain how drones can be used other than for taking selfies. But, before that can happen, common sense regulation is needed, the panel argued. Chris Blackford of SkyFutures stated that his company, which provides drone solutions for monitoring oil pipelines, faces generational challenges in getting big companies to transition to using, what he said, are basically flying robots. His company spends a lot of time educating users. It’s an easy win with younger generations. Jay Bregman of Verifly explained that the drone market is still dominated by consumer drones and even those that are accredited to fly commercially often purchase drones intended for consumers like those sold by DJI. Regulations still pose a major challenge. France has a great model, Buddy Michini of Airware said, pointing to the common sense regulation that the US largely mirrored in the creation of its upcoming regulation. “In the US you don’t have to register your guns, but you will have to register your drones,” noted Lardinois. Bregman pointed to automotive history when arguing for drone regulation. He pointed out that regulation and mandatory insurance grew out of a rise of accidents, which stuck victims with the bill. And as the drone market will grow exceptionally over the next few years, the market will require similar practices. Registration will give owners a sense of responsibility, said Blackford. “It’s the first step,” Bregman added, giving the example that if a drone crashes into a person’s yard and causes damage, they could give the drone to the police. The use of drones by consumers and companies has exploded over the past few years. As the devices have soared in popularity, a lot of the critical features and functions have rapidly improved. The aircraft have gotten steadily cheaper, more powerful, and easier to use. The cameras have gotten better while also getting much smaller. The autonomous navigation has evolved by leaps and bounds. One thing that has not changed much, however, is battery life. Remember back in December 2013 when CEO Jeff Bezos revealed Amazon Prime Air, a futuristic drone system that is supposed to one day deliver your packages in 30 minutes or less? Almost two years later, as competitors scramble to match it, the company is once again pushing its idea forward, this time with an ad narrated by Top Gear’s ex-cohost, Jeremy Clarkson. The goal here is to show you just how useful Prime Air, which is currently being developed in the U.S., the U.K., and Israel, could be if regulators ever approve deliveries by drones. The new video shows the latest prototype model of the Prime Air drone: It’s larger, features a propeller system for vertical takeoff and a second one for horizontal travel to the destination, and is apparently just one of many (although all will apparently fly under 400 feet and weigh less than 55 pounds).